The Power to Make Things Simple - Wisdom, sleeping..
Making things simple is complicated! 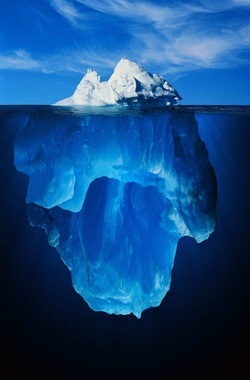 To speak plain and clear you need time and depth; like an iceberg - a quiet crystal peak above the waters, holds centuries of frozen storms underneath. Fast simplicity has little chance. Like pressing square pegs into round holes. Like chopping a living being into its organs and stitching them back together to explain life. Like treating your audience as stupid. One’s deeper understanding forms subtle intellectual shapes. Yet, all this subtlety must remain your own concern; when you go out to do things among people better be as obvious as daylight. This shedding of light is a competence which requires particular understanding and know-how. For you, for me, to understand means to place something in accord with our reality as we live it; with the effect that it may become part of it, of our common sense reference. Understanding brings things within our minds’ direct reach, compatible and articulated with our existing representations and ways, so that the words become ours as we become qualified to use them**. Nobody else can understand on your behalf or hand understanding over to you. Other people can explain to you but not understand for you. You are the only one who can grasp, for yourself. You understand that which resounds in insights and metaphors familiar to your mind and in words, commonsense to you, which you are at ease to use. You understand when you exclaim: "Aha! "; "So this is what it is!" "This is what it means for me", "This is how it works!". The competence to trigger someone else's understanding is a fine art and gives power to influence other peoples' views, judgement, decisions and actions; there is also intrinsic value in making things simple because complexity - like all unfamiliar things - disquiets, threatens or stupefies and we all need to escape its uncertainty; instead, simplicity feels homely and practical. Let me sketch the problem as it is felt: Much detail is foreseeable confusion... Too much analysis is paralysis... Accurate academic abstraction is an alien planet which we must believe on unverified trust... Plenty of choice is perplexity... Too many probabilities beat the mind... Multiple opinions spell conflict... Profuse words are suspect of ignorance and a will to mystify... Precise expert explanation is unnatural technical jargon made to keep us dependent on that expertise... Erudite abundance and subtlety feel like insult to those who do not grasp them... This is the humble psychology of complexity brought to people. The exponential growth of science, technology and communication, floods us with complexity and load of informations beyond the individual mind's capacity to comprehend or check. Complication, abstraction, specialisation, like most unfamiliar things we do not understand, cause overload, uncertainty, insecurity and a sense of incompetence: Normal people, as I found, are lost in complication, distracted by diversity, startled by newness. They hate to decide - particularly among many choices - and are anxious to be exposed when they do not grasp. "Simplicity" opposed to this, makes one feel in control, apt to judge and to act; "plain" things are seen as elegant, obvious, transparent, reality itself; plainness gives a sense of natural comprehension. What you understood, you own. Or at least you trust. This sense of understanding is a certifying bridge between that tiny but reassuring bubble of personal experience we have of the close, verifiable with our senses and all the rest of our reference about the World - that immensity of indirect knowledge which we learned from other people, whose sources are distant or inaccessible, so that we obtain it exclusively by trust in the witnessing communication by others. The one able to translate alien complexity into credible familiar simplicity has therefore power. And influence. And responsibility. When you represent things in understandable form, that is, in the universal language of common sense, you diminish uncertainty; this is the magic wand of the wise, provided it is not left to charismatic tyrants, populists, false prophets, illuminated ideologists, unscrupulous salespeople and other liars gifted to use and abuse the vulnerability of common sense. In exchange of clarity and simpler choices that make them feel secure, people delegate, unbeknownst, part of their judgement and freedom. We trust instinctively those who make us understand. We seek those who reduce our doubts as we trust those who made us believe. We follow those who show ends of tunnels and light in the dark. We entrust the clarifying minds to think for us and to define what things are, to explain how they are and what they mean, how the world is, what choices we have and thus, what we should do. The subject understood grows into the unquestioned fabric of our personal common sense view of the world. Inevitably, we trust our understanding. That is the ultimate reference***, the basic beliefs we rely on, without questioning, in our daily life and in critical situations. 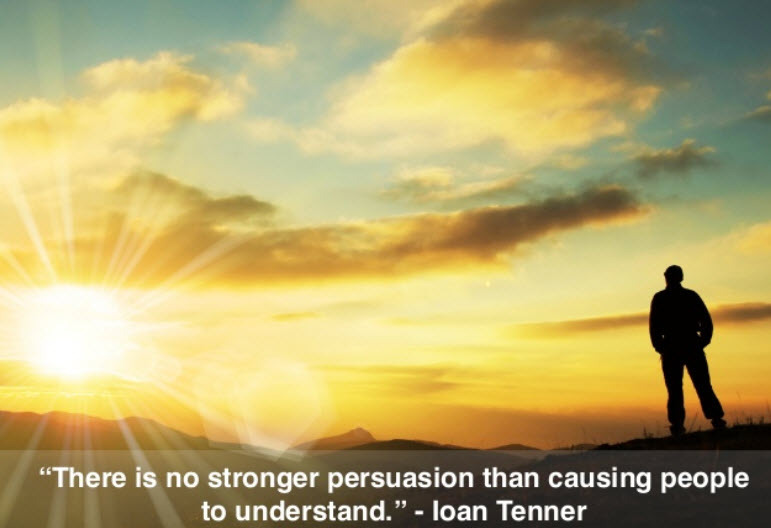 There is no stronger persuasion than causing people to understand: the map formed in our mind will direct - with its frames and references and short-cuts - what we think and what we do. Even when we do not like it. On top of this, what we came to know, we cannot un-know. This could be the template of a universal rhetoric for the Twenty First Century. One beyond mere words and arguments. This is power indeed! And moral risk! When you make things simple you are responsible personally (and without ulterior control) of what you do in your interpretation. You induce values and actions. You have no excuse to hide behind the ethics-free authority of authorities: serving knowledge, general acceptance, methods, theories or instruments. You are not justified saying that it is Science, "Truth", objective reality, facts and figures for which you are merely a humble messenger. It is you, your interpretation and your advice, as good, responsible and true as you. Making things simple has a moral flavour. Making simple, translates knowledge into personal knowledge and seeds the knowing among persons by means of the universal, yet intimately resonating Esperanto - or if you prefer lingua franca - of common sense. Making things simple is then a synonym of communication comprehensible and fit to be remembered and used at the receiving end; certainly, there is also the other great simplicity of the things themselves or the gift of mathematicians, artists, thinkers and spiritual masters to actually create simple, universal, elegant, economic, objects, visions and theories that give meaning to the world, but that simplicity is another subject of mastery, for another occasion. For something to be simple to us, we can form an image of whence it came and where it goes. Thus, simple is for us that which appears transparent and makes sense to us; that which takes the size and shape of our mind, that which fits into the whole of what is already there, which we can put our arms around; which is not out of our reach and beyond our attention span; which we can behold with our eyes, our ears, our hands, with our imagining, with our common places; something which feels within plausible means, intelligible, doable, practical. At the core, it is something which fits the routines of our body and mind. Making things simple (without falsifying them) can generate wisdom, because the persons receiving become able to judge with their own mind. They are empowered to make sense and use of things from their point of view and in their perceived best interest. They can own what they know and hence they are put in the centre of their world, free to chose and navigate in the world.. This is the opposite of explaining things as complicated as they are, or even more complicated and opaque, beyond a lay person's possible understanding, so that no free decision is possible, no real choice or vote, except to trust and submit to the witnessing authority and the formal intelligence of the scientist, the reduction of the theorist, the mechanic algorithms of computers, the tool-kit of the technician - all of them empowered alone to reveal and decide what exists and what not, what is the real sense of things and what is good for us. The sand of the beach with its myriads of grains, the starry sky, are simple (for us); driving your car is simple if you did it for a while and do not need to lift the hood. Familiar things grow simple, the old grows simple but everything new is so complicated! The bike or the horse you ride for the first time, the new can opener, writing an important letter, first time of making love, your first baby are complicated and intimidating, to boil an egg or to "set up" a computer is complicated if you do not know how; remember how hard it was to learn the letters of the alphabet. In the alien country everything is confusing, because you miss the language and the mores. The most complex thing that counts for us is change when it is "something else"; the not yet known, the unknown are complicated, with too many unforeseen possibilities. Taking things with fatalism, as they will come, is simple but foreseeing what may happen is complex work for the mind. If you want to use the power to make things simple, discern how different it is from vulgarisation and baby talk; making simple conveys faithfully, at your best, the essence of the original structure and meaning in understandable language, representation and inspired examples, while vulgarising (and even rationalistic reductionism) omits parts, abstracts, distorts and dumbs down “for the ignorant” to a lower level; for such simplifiers, keeping simple means keeping stupid. The attitude is radically different, respect against looking down at people. Making things simple is a translator’s work. It consists in devising understanding on behalf of other people. For this, you lift ideas, explanations, narratives, things... from one frame and fit them into another frame - that of the people you want to inform, move and help; their frame. (imagine this word, "frame" like an actual frame of a painting; you need to fix and delimit the picture in a local frame, meaningful and acceptable to your target public). While rendering in a new frame, you translate and interpret from one language to another, from literary into vernacular, from one point of view (or even world-view) to another, one context, frame of reference and set of references, level of abstraction and occasion to another, from one image to another, one paradigm to another, from one culture to another, from one understanding and sensibility to another, and sometimes even from one truth to another. Deeper, your work is to discern the "meme"**** the idea or structure of meaning viable to spread into other minds; once understood, you become able to formulate it in many languages and various levels of complication or simplicity. That which you understood, you convey avoiding the too many of words - following the old precept of Occam's Razor***** - the law of succinctness. This law of parsimony advises to chose the interpretation with fewer components, to use the minimal number of assumptions necessary, but in no way less than the explanations necessary to represent truly. As for any form of translation, you must master the two languages, and be aware of what you do; imagine someone who only knows the language from which he wants to translate, not the target language; or imagine a book translated by someone who does not understand it; imagine a book simplified in translation – that is the difference between making things understandable and vulgarising them for people considered too silly to comprehend. Traduttore traditore. To make things simple, you do not scorn your public, on the contrary, you respect people, you have empathy and patience; it does not help to shout louder from your ivory tower to those people you do not know or understand or care for. They hear very well, maybe better than you; it's just that you do not make sense to their local world. The dark side of the power to make things simple is falsifying them simple, lying that they are simple when they are not. The worst is when the plausible simplicity conceals manipulation. That is the mark of the false prophets, tyrants, unscrupulous ideologists, the crooks and the fanatics of all kinds. The stooges and zealots educated and armed with such simplism are the people with the hammer, for whom absolutely everything looks like a nail. Totalitarians lie things simple to reduce them to their unique fixed idea. The most evil and stupid of social orders go beyond presenting complexity and variety as simple and all the same; they even proceed to simplify social reality itself and to force all people receiving their lies to become simple and all the same in a world with minimal mechanic choice. This neighbourhood of deception and delusion keeps the art of making things simple always on the brink of cheating. Knowledge is grounded with measurement, reason, proof and fact; the metaphors and examples easing its understanding - the commonsense understanding of the selfsame true knowledge - are based on obviousness and confidence and have only as guardians, your competence and sincerity. The tool is as good as you. The first is, I think, plain ignorant stupidity, unable to discern what is significant and what not; meaning in a wider frame, importance of choices, causes and consequences; to make something simple for other people you must first make good sense of it for yourself and additionally perceive differences in point of view. The strangest enemy of intuitive simplicity is, sadly, not stupidity, nor ignorance but scrupulous knowledge, the cult of truth and fact as it is “in itself”, born from meticulous expertise and an intransigent scientific training; scores of excellent specialists suffer from never having learned or understood that knowing and applying expertise is one profession while serving human interest, transferring expertise and helping people is a completely different role – to be played by the same expert – with different rules and different aims adapted to dissimilar situations. Some of the best minds never learn to "think people". Curiously, others, highly gifted and educated, but who lack a talent of understanding the here-and-now prove to act quite stupid when it comes to making things simple; by neglect and misfit with the people and circumstances they address. Causing humans to understand is not a mechanic “process” of explanation one could copyright, multiply like software and sell in a box. Let the post-humanist AI dream of that. Making simple - as close to art as it is - is not a mystery trick either, like cracking your fingers or wielding a magic wand but a constant attitude and an effort - conscious work led by a steady strategy of wisdom. Those gifted to talk content-free with a charming air of being simple but with no real knowledge to give, may cheat people but only produce confusion, not understanding. Your mental orientation in making things simple is to find or to give to everything a human and local meaning, to put the human person you address in the centre of the Universe. You make things simple because you are intent to put everything humanity creates, as means in the service of human beings, instead of allowing the opposite - humans becoming means, slaves and victims of their own creations. This is not showmanship. Making things simple is a rhetoric – intuitive, convincing discourse (with words and many other means) addressed to intuitive reasoning. You foster comprehension with pointing to present example, to metaphor, stories, myth, narration; such means are meant to be graphic, "representable", understood, not believed. You do not want people to believe your metaphor; you want them to understand it and to understand by means of it. Metaphors do not explain, they only give shape or body to a subject. That shape must appear familiar. Ideally it will be a common place, something already received and accepted, obvious to your public. - I always wonder. How is it possible to put all these things with such complicated shapes into a plain machine that only knows “yes” and “no”? I cannot figure this. - You know, I said, it is like needlework, you have just two needles and a thread. With them you give to the thread of wool a form of pullover in any shape you need; and you can crochet into it quotes from Shakespeare. Observe the difference between lying that computing is simple like needlework and using a visual image that satisfied the need of representation this man had. Naked truth is not simplicity. To use the power, do not confuse simplicity with precision either. In fact, precision is not even truth, it's just many facts. Precision is intricate, built on expert analysis with sophisticated instruments, advanced knowledge, distinctions and subtle jargon known to few. Precision looks simple only to the expert. If you want to confuse people without fail, flood them with all the rigorously precise information and facts you know. A strange sort of truth is that which is not understood. Could it be deliberate obfuscation? For living people, truth requires some familiar shape. “Precision is not truth” as Matisse the great painter wrote so resoundingly . Art – that lie created to tell the truth  – has the power of making people understand, make theirs that which counts, instead of snowing people with details. Quality simplification needs not be precise but must be – let me repeat – honest and intelligent; you explain loyally what you understood, not what you didn't. It must also be inspired; making things understandable is talent, an art, not science. I hope I repeated this sufficiently to make my point: to make complex reality simple you do not measure it better, count it better, analyse it better or describe it more strictly; what you do is to interpret it from a human angle, with us as a measure of all things, to create a familiar representation that will organize it with intuitive meaning, formulate it in household terms, from the person’s point of view at the centre. You do not start from what you explain, but from where the people's mind is. Simple is not that which is true, rational, factual or perfect but that which is analogous and consistent to what we know; because it is similar it fits the mind; because it fits the mind it makes sense; because it makes sense is accepted. Because it is taken possession, it will have effect and it will be used. To make things simple you point, you use familiar image and concrete examples; you summon likeness and experiences and words people know already, use them as comparisons and by their means you advance towards that which is yet unknown. Observe that you do not make things simple in general, but for specific persons, often here and now. To do this, empathy has no replacement; you must imagine yourself in the other’s place. For this reason, you do not start a good explanation from a distant subject to describe it to the people down here; you start from the people present (from where they are now), you take them with you and explore with them the subject up there: and you do it in their own words and examples. This is the secret formula from the grimoire of masterful teaching. First you know so little that things look simple to you. Ignorance sees things simple grasping only what meets the eye. This is false simplicity. As you learn, things become extremely complicated and your mind is falling to the cult of precision and completeness; to explain, you must tell everything. The map grows as large as the territory . Erudition discovers and knows successively the bitter-sweet despair of never-ending complication. Now, simplicity is impossible. Finally, there is this sudden moment of bliss when "Aha!" everything falls in place and things are simple again but in a new way. Now you see form and order, coherence in complication, symmetry in chaos. You see the few things that count. You may even glimpse from where things come and where they go. Understanding crystallizes the essential, in a clear form and in your own words, coming naturally; now you got the power. You are ready for making things simple. This new gift emerges after you forgot everything you learned “in school”, as Einstein wrote . You make things simple to understand, but also simpler to live with; to choose and to decide – to act. When people find things too complicated to do something, making things simple means showing what and how they can, and better, proving that they can by showing them how to do; or even what to do. Beyond understandable words and image, the way to make simple is to show and do interactively, ideally by doing things together until they succeed; one meaningful image is worth – we know - a thousand words; but showing how and doing things together is worth a thousand images. Indeed , you understand a thing when you try, and even more when you succeed to change it. This is another old secret of learning by means of apprenticeship with a master now depreciated by cheap mass schooling. You made things simple indeed when you helped people see them, feel them, represent them, try them out and do them across error and success. “A good specialist can explain with precision. He can explain things as complicated as they exactly are. A good consultant can explain with simplicity. He can explain how doable things are." While you listen to an expert who "explains" a problem, the normal urge is to delegate it back to the specialist: “Do it for me, it is too complicated!” Instead, the true consultant will leave you able to do it yourself. My father, a university professor in “electronics and automation,” used to speak to me like a honest expert. May he rest in peace! I would ask him to help me solve some mathematics problem for the next day in school; but he, the uncompromising intellectual, needed to explain first the foundation of mathematics. This is probably why I became a psychologist, a TV journalist and a teacher and, finally, a consultant and who I am now, anything but an engineer. On reflection, I wrote this essay to honour my Father; to dialogue with him once more and thus, to keep him for another instant in the Book of Life. To make things simple you find, or, if needed, you invent with fantasy, landmarks, shoulders of giants, fulcrums for the lever of comprehension  on which our mind leans to move its world. You scaffold and organise. You build steps and ladders. When you want to make things simple in deliberation among many choices, you do present the variety, with pros and cons, but you do propose one or two relevant directions, judiciously, for the decider to choose responsibly; and you advise one if you bear to take risk. As I love to jest, Tenner's one-way principle is simple: there are many ways, but to walk you must take one. There is infinity of directions around us, too many for mind to embrace; to make things simple you use a few cardinal points – North, South, East and West, Up-skywards and Down-where things fall. As we humans are familiar with our symmetries, to make things simple find symmetry; or lay things down in some symmetric form easier to grasp and remember. To make things simple, discern forms. Think shapes. Find or sketch Gestalt. If you look at complication you often see that it has some shape; use that shape to help understanding. Complexity is not born counted but you can count it and group it, mind size: 1, 3, 5, 7, 9... that is a normal span for human attention, not more. Threesomes and foursomes - which I like so much to use - organise complication or the unknown; they do not reflect or "know" complexity, but order it. They only project temporary order into complexity to make sense for people; then, after using them, you leave them aside as you do with a tool, only used when needed; you do not carry them forever, nor, heaven forbid, start to believe in them because they used to work. Making things simple is work for the wise. If I understood all this, (and many more of the same style), if I look at the world like this, in this complicated way, I am closer to make things simple for other people. Then since I have something to say other than chatter, it is worth learning how to communicate with an effect. 1. Keep silent often and observe, to understand the environment and the occasion. Ask and listen, do not interrupt, to find out what people know, the words they are familiar with, the references they trust and understand. In this way you will know “where their mind is” and of what it is made - the first condition when you want to change that mind, as you mast start from where they are, not from where you, the knowing one, are. 2. Repeat to keep interpretation fool-proof. Avoid surprise - it is confusing - or if you must surprise with newness take time for the surprise-state to cool down. Start by saying what you will say to create focus and proper expectation; then say or show that which you want to make simple; encourage questions to understand what was not understood; ask if you can to be explained back what you said; end by saying again what you said. The ultimate proof of success is when your public starts using, altering, contradicting - in short doing things because they now own them. 3. Learn to teach. If that is practical, encourage people to learn from themselves, to put their heads together and explain and show each other what they know and do. Let them ask you to help instead of pushing your knowledge: let the guest ask for the salt. Help prepare the stone soup, like in the well known story. If needed you will add your grain of salt and turn the brew with the spoon at the right moments. If needed you will add things they do not know, without boring everybody with basics. It may even happen that you don’t need to speak at all and people appear to do things by themselves. 5. No Three Letter Abbreviations, no jargon! 6. Be short, as short as useful and as simple as possible but not simpler than that; 3, 7, 9 are not only symbolic figures they are also amounts fit to the attention span and the human memory. 7. Remember to serve your simple soup of explanation not only tasty but hot, in a large bowl, provide redundancy and time and let people serve themselves with their ladles; do not try to feed them with a funnel: you can take the horse to the water but you cannot make him drink. Accept that some of your precious brew will be spilt or will get cold and wasted. 8. As I explained, use metaphor and stories – they make people understand new, unknown things in terms of what they know and they advance by the intuitive logic of narration. Equivalent with metaphor are example, gesture, demonstrative action and showing how to do or how to refrain from doing. 10. The most powerful audio-visual tool is the finger that points. 11. When it comes to decisions and action counsel top-down, from what to do towards why to do it; from the essential conclusion to the proofs. The discourse of action is strikingly different from the discourse of science; it is a rhetoric, not logical induction or deduction. Do not start as researchers do with many facts, explanations, justifications and proofs, to finish in the tired end with a conclusion, finally followed by some proposal; on the opposite, start with your advice what to do, when, for what purpose and value expected, and then, as needed, give more and more required causes, proofs, arguments, explanations and data as requested by mainstream “critical thinking”. Let people know with what observable outcome and benefit they should act and with what disadvantage or danger is that thing is not done. Knowledge that makes sense is for the benefit of people. Always end with the first next step to do. "Because it does things easily, simplicity resembles God who easily creates everything." * There is no such thing as "making things simple in general", or "objectively. Simplicity is in the living person's mind, relative to a person's or to a group's shared knowledge; felt, not formally explained. "Simple" means that it makes good common sense here and now, for these people, in this context, with this purpose. Simplicity is by our personal measure. Universal simplicity is a machine-dream. It is true though that proper understanding also includes becoming acquainted with the "thing", as it is situated, represented in its context of origin and measure. ** Ludwig Wittgenstein, Tractatus Logico-Philosophicus(1922) : "4.021 A proposition is a picture of reality: for if I understand a proposition, I know the situation that it represents...."
 Borges: “. . . In that Empire, the Art of Cartography attained such Perfection that the map of a single Province occupied the entirety of a City, and the map of the Empire, the entirety of a Province. In time, those Unconscionable Maps no longer satisfied, and the Cartographers Guilds struck a Map of the Empire whose size was that of the Empire, and which coincided point for point with it. The following Generations, who were not so fond of the Study of Cartography as their Forebears had been, saw that that vast Map was Useless, and not without some Pitilessness was it, that they delivered it up to the Inclemencies of Sun and Winters. In the Deserts of the West, still today, there are Tattered Ruins of that Map, inhabited by Animals and Beggars; in all the Land there is no other Relic of the Disciplines of Geography.” On Exactitude in Science, Suarez Miranda,Viajes de varones prudentes, Libro IV,Cap. XLV, Lerida, 1658, From Jorge Luis Borges, Collected Fictions, Translated by Andrew Hurley Copyright Penguin, 1999. Archimedes; “Give me but one firm spot on which to stand, and I will move the earth.” The Oxford Dictionary of Quotations, Second Edition, Oxford University Press, London, 1953, p. 14.